Raaga.com: Wanna guess what South Superstar Dhanush shares common with Bollywood King Salman Khan? 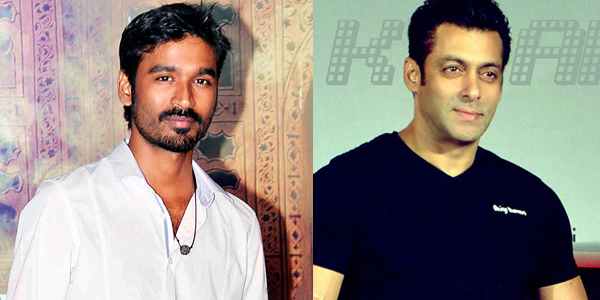 Wanna guess what South Superstar Dhanush shares common with Bollywood King Salman Khan? In terms of stardom, both South Superstar Dhanush and Bollywood King Salman Khan, share equal popularity around the globe. But there is another one quality that unites the South Superstar and Bollywood Monarch. Wanna Guess what? Well both have a keen eye for a selecting the ‘perfect’ script that would hit the bull’s eye. Besides eyeing for commercial success; the two also have the vision to foresee that the movie leaves an impact on film critics thus winning both commercial and critical acclaim. Something similar to movie wizards like Guru Dutt, Raj Kapoor, Yash Chopra, Raju Hirani etc in Bollywood and master filmmakers like L.V. Prasad, K. Balachander, Maniratnam, Shankar etc. down South film industry. A picture of their success as producer can be gauged from the fact that if Dhanush fetched a National Award for Best Children Film with his Tamil film KAAKA MUTTAI, he has added another feather in his cap as producer by winning the prestigious Venice Film Festival for his Tamil film VISARANAI. The film has won an award under the Amnesty International’s Cinema for Human Rights section of the 72nd Venice International Film Festival. What is most admiring is that VISARANAI, is not only the ‘First’ Tamil Film to win the Venice Film Festival but it has the rare distinction of being the first Tamil film to have ever been screened at the Venice International film Festival!! Speaking about Salman Khan, his BAJRANGI BHAIJAAN has broken all box office records and the movie is expected to certainly fetch the National Award in Best Film providing Wholesome Entertainment category. In addition his latest movie HERO, introducing new debutant actors Sooraj Pancholi and Athiya Shetty has again proved a hit both commercially and critically. Interestingly Subhash Ghai, the original filmmaker of HERO initially felt the movie’s subject was stale for today’s generation but thanks to Salman Khan’s vision the movie has proved a hit! What is amazing is that while Dhanush fetched a National Award for Best Children Film KAAKA MUTTAI. Incidentally Salman Khan too won a National Film Award for Best Children's Film for his movie CHILLAR PARTY in 2011. Thus there is definitely something common between the two and we hope the two shine the name of film industry by making excellent movies as were made by the legends mentioned above! !